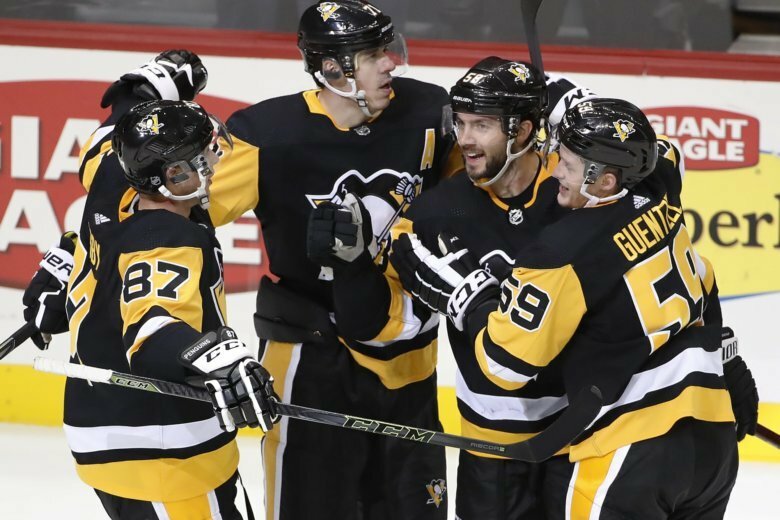 PITTSBURGH (AP) — Kris Letang scored his second goal 1:20 into overtime to give the Pittsburgh Penguins a 7-6 victory over the Washington Capitals on Thursday night. BUFFALO, N.Y. (AP) — Jaroslav Halak stopped 32 shots and Boston rebounded from a season-opening shutout to beat Buffalo. Brad Marchand set up all four goals, scored by captain Zdeno Chara, rookie Ryan Donato, David Pastrnak and Patrice Bergeron on an empty-netter. A night after a 7-0 loss at Washington, the Bruins had an easier time against the NHL’s worst team last year. The Rangers turned up the intensity in the closing minutes before Sissons’ empty-netter with 1:24 left pushed Nashville’s lead to 3-1. Buchnevich scored with 35 seconds remaining. RALEIGH, N.C. (AP) — Josh Bailey scored a power-play goal 43 seconds into overtime, and New York opened the season by beating Carolina. Valtteri Filppula also scored as the Islanders began the post-John Tavares era by giving Barry Trotz a victory in his debut with the team and spoiling Rod Brind’Amour’s first game behind the Carolina bench. Trotz took over shortly after leading Washington to its first Stanley Cup, taking over after Doug Weight was fired. Brind’Amour, the captain of Carolina’s Cup-winning team in 2006, replaced Bill Peters after he left for Calgary. DETROIT (AP) — Artemi Panarin scored midway through overtime, lifting Columbus past Detroit in the opener for both teams. Joonas Korpisalo stopped 18 shots for the Blue Jackets. Detroit’s Jimmy Howard made 36 saves. OTTAWA, Ontario (AP) — Patrick Kane scored 38 seconds into overtime to push Chicago past Ottawa in the opener for both teams. DENVER (AP) — Nathan MacKinnon had a tap-in goal off a nifty pass from Mikko Rantanen, Semyon Varlamov stopped 20 shots and Colorado beat Minnesota in the opener for both teams. DALLAS (AP) — Devin Shore, Alexander Radulov and John Klingberg scored less than two minutes apart in the second period and Dallas made Jim Montgomery a winner in his NHL coaching debut, beating Arizona. ST. LOUIS (AP) — Patrik Laine, Blake Wheeler and Kyle Connor each had a goal and an assist to help Winnipeg beat St. Louis. LAS VEGAS (AP) — Wayne Simmonds scored two goals to lead Philadelphia over Vegas. Vegas’ Marc-Andre Fleury allowed five goals on 16 shots before being replaced by Malcolm Subban with 9:49 left in the second period. Jonathan Marchessault and Pierre-Edouard Bellemare scored for the Golden Knights.